Why are you still single? When are you going to get a partner? And if you have one, will when you bringing him/her home? To singletons out there, you don’t have to worry because there is an app for you to deal with these kind of questions. Introducing Invisible Boyfriend and Invisible Girlfriend, the app that allows single people to create their very own imaginary partner, with customised personality and interests. 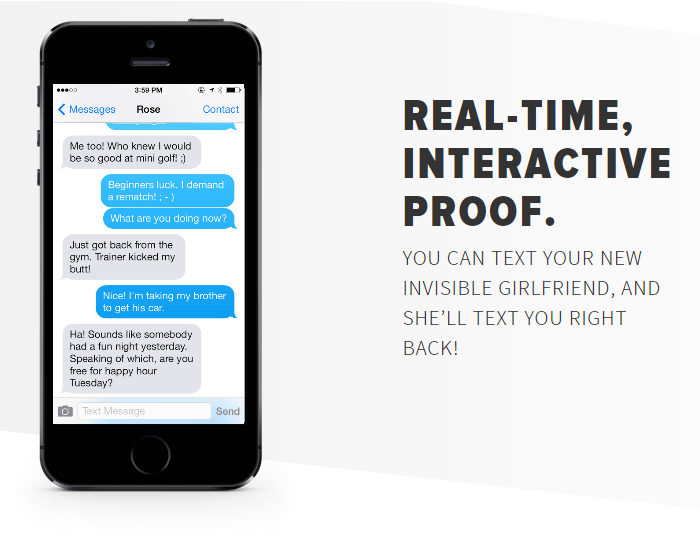 After that, the app will send convincing text messages and even voice mails as evidence of your special romantic relationship. Because you obviously deserve a sappy lovey dovey partner who sweeps you off your feet, don’t you? Invisible Boyfriend and Invisible Girlfriend source the images for their fake lovers from real people online, by hiring professional models and make use of stock photos available. In 2013, Homann and his business partner Kyle Tabor took part in the St Louis startup Weekend contest by pitching the ideas of these two domains, and they won the contest. The app is not a permanent solution. However, you can still use these apps as a get-out-of-jail-free card by telling people that you do have a partner but sadly they are just too busy to show up. Simply put, the idea of the app is help you to create a solid and reasonable story that you can tell to your curious friends and family. The text messages includes a combination of automated messages and those write by real humans to ensure that these stories will not sound like they’re churned out by a robot. Besides that, both apps have ruled out sending sexts or NSFW type of photos. At the moment, the apps are available as a private beta version in the US and Canada. Which means that unfortunately those who are not in the US won’t be able to reap the benefits from the apps, although you can still fool around with the website and create a fake girlfriend/boyfriend story. The apps are priced at $24.99, comes with 10 voice mails, 100 texts and one hand-written note from “the partner”, “virtual proof” such photographs, online conversations and customisable back-stories about your relationship. Or you know, you could just tell your relatives that you’re still single and you’re patiently waiting for the right one. [COMICS] Dating App Tinder Can Reveal Your Real Location. Here is How.